Can anyone identify this bear? His nose is stitched - it is a bit untidy. 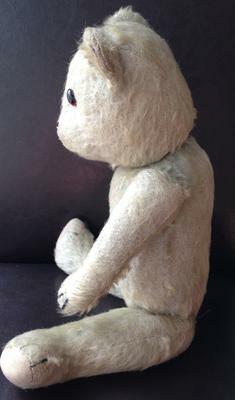 There is a single stitch as a dot above the nose on the teddy's left hand side. The one on the right is missing. The eyes are amber & black. I think they are glass as they are cold against skin & hard against teeth. The bear is stuffed with wood wool as he crunches when squeezed. His head is very hard & difficult to squeeze. 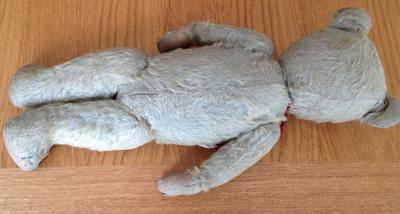 The bear is approximately 15 "
The fur is blue although what is left of it is very faded now. He is jointed 5 ways - head, arms & legs. His pads are brushed cotton & he has 3 stitched claws on hands & feet. He definitely had a hump. Although it has flattened over the years you can still feel it. He has hand stitching on his tummy in blue thread. Think growler has been removed and this is a family repair as same thread on one of the pads on foot. If hand stitched on the back to be stuffed then used invisible stitching but there is a definite change in the stitching. Top & bottom of bear's back can clearly been seen as machine stitched. The change in stitching is in the middle of his back & is 3" long. Not sure if original but has half a red ribbon tied around his neck. This is my Dad's childhood bear so has definitely been in the family for approximately 75 years. He was born at the outbreak of WW2 in 1939 in Walsall, which was then part of Staffordshire. He does not know if he had this bear from new or it was handed down. As it is blue it is obviously a boys bear. His older brothers were born in 1927 & 1931 although my Dad was the baby of the family & so therefore it may have been bought for him as new. 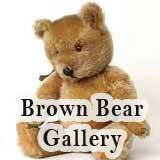 It is always very difficult to try and identify bears from this period without their labels. 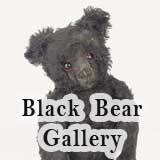 Often noses and ears have been re-stitched and can change the bears appearance. I cannot give a definite answer all i can do is to give you a few ideas. I have looked through my teddy bear catalogue of British bears from the period and at first I thought the bear may have been a J. K Farnell Alpaca range for babies 1030's. But the eyes are wrong as they would have been made from felt. 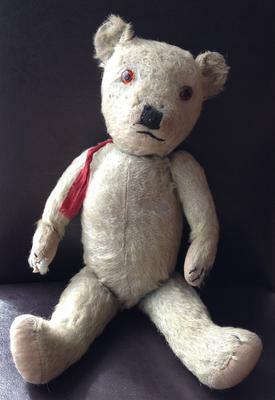 The other possibility is a Merrythought bear from the early 1930's alternate design which came in several colours including iris. 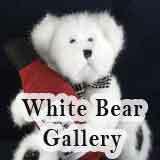 Your bear has some similar characteristics. There would have been a label stitched on the left foot pad originally. You would have to contact them to see if they have any records of this bear. 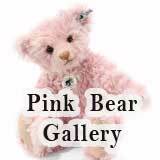 During the war years there were many small UK companies making bears and so it is possible that your bear comes from one of those companies and would be very difficult ti identify. Anyway i hope I have given you a few ideas. I have a Chad Valley bear around this size with the same eyes and many other similarities. Mine has the label on the foot. My vote says Chad Valley! I think he is a Chiltern Bear. He has the distinctive face and they also produced a coloured range. Can't tell the age from the photo, possibly 1930s. 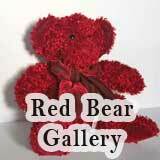 I have a very similar blue bear to this! Hello! 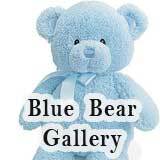 I have VERY similar blue bear to this, which I was given by my mother. It is a chad valley bear, with the same stuffing you describe and used to play 'rock a bye baby' from a musical box inside. The box is still there but long since silent. I don't think it is as old as yours though, as I am pretty sure my Dad gave it to my mother in the 1960s - and I think it was new then.